Canada has a rich heritage of English-language communication thought. For the first time "Canadian Communication Thought" assembles much of this erudition by introducing and examining the writings of ten foundational scholars: Graham Spry, Harold Innis, John Grierson, Dallas Smythe, C.B. Macpherson, Irene Spry, George Grant, Gertrude Robinson, Northrop Frye, and Marshall McLuhan. 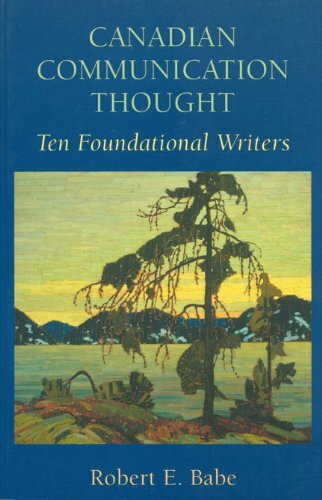 The author compares and critiques the thought of these ten sages, relates their writings to their biographies and to the Canadian physical and cultural environment, and compares their work to foundational American communication scholars. He finds that there is indeed a mode of theorizing that is 'quintessentially Canadian.' Compared with the work of foundational American writers, for instance, the Canadian literature is significantly more dialectical, ontological, holistic, and critical; it emphasizes to a much greater extent the impact of communication on social change; and it is more concerned with mediation and the formation and sustenance of culture and community. The Canadian writers are also much more engaged than their American counterparts with the question of power in communication - with what can generally be regarded as matters of political economy.